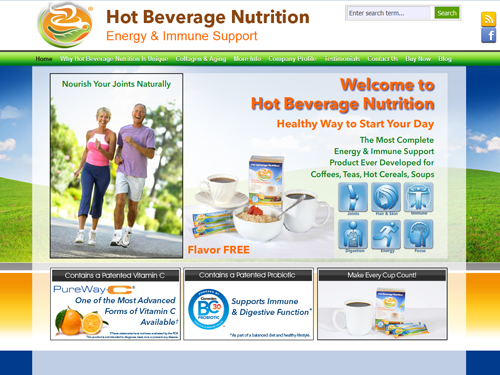 Growing Minds, Inc. redesigned the web site for Hot Beverage Nutrition, Inc. an innovative company dedicated to bringing naturally advanced immune and body support products to the hot beverage market that have otherwise been unmet by traditional solutions. A Flash animation is included on the home page, and a matching Facebook business page was created to coordinate with the look of the web site. Growing Minds also incorporated search engine optimization (SEO) and a blog in the newly redesigned site. In addition to Hot Beverage Nutrition’s online presence Growing Minds developed promotional materials for Hot Beverage Nutrition’s dealers and distributors and modified the product packaging for point of sale displays.